This entry was posted in Travel, USA and tagged flowers, ice cream, Maine, souvenirs. Bookmark the permalink. I love Maine. My husband was born and grew up in Bar Harbor area and we go almost every year. I have been to Maine in both winter and summer, and it equally love both seasons. My goal is to visit Maine in the fall because I have seen some amazing photos of Maine scenery. I love your pictures- would you mind sharing what town you were in? Thanks! I hope you get to visit Maine next time – it’s really beautiful there! Thanks for the lovely New England tour, Meg. The big blue hydrangea along the white porch rails reminds me of a summer day. Beautiful! 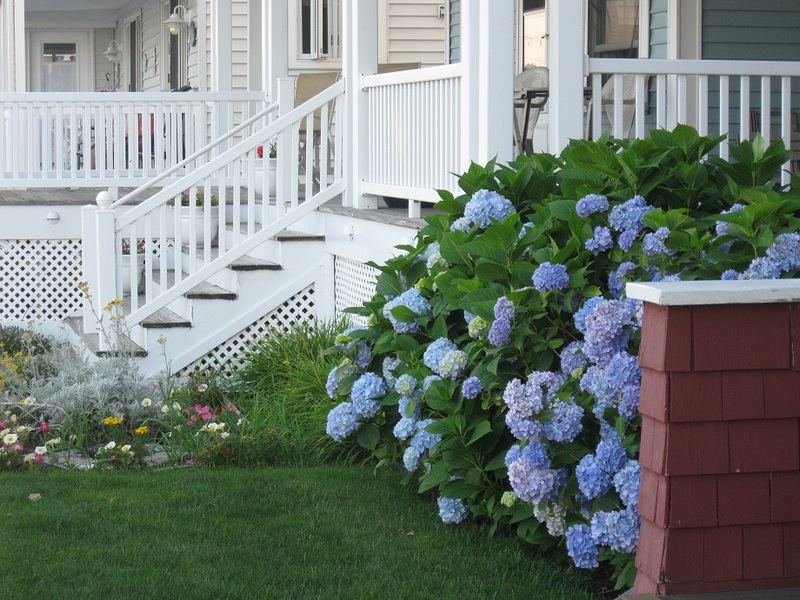 Thanks Elisa – the hydrangeas and the white porch were like souvenirs of a summer day! Like Sas, I’ve always wanted to visit Maine too. I’d love to spend at least a month there discovering lots of quaint towns and trekking through Acadia. Blue and purple hydrangeas are my favorite flowers, and set against the white house, it’s a perfect cottage-by-the-sea scene. Love that sweet hydrangea bush! I do too – it was so bright and cheerful! Oh our way to Maine at this very moment! You have added to the anticipation. It’s lovely to go back to places associated with happy memories. I love the beach and am lucky enough to live a ten minutes walk from one. Someday I’d love to visit that area. It looks so civilized! It’s a charming place to visit with lots of people that return every year! I’d love to visit Maine. Beautiful and inviting photos, Meg! It does look like an inviting place. My daughter can’t wait to go back. It’s definitely a place to visit more than once – there’s so much to see and do! I loved our summers in Maine. I’m glad you had a nice time during your visit there. Thanks Karen – Maine is such a wonderful place to spend the summer! I bought one of them and it makes a great souvenir! What glorious hydrangeas! Mine didn’t do anything this year… Lovely inviting shots! A really good theme for a post. It was a great theme and a very welcoming one too! I might borrow it someday with due acknowledgment. There are lots of little things I have photographed and have been wondering how to present them. Would that be ok?